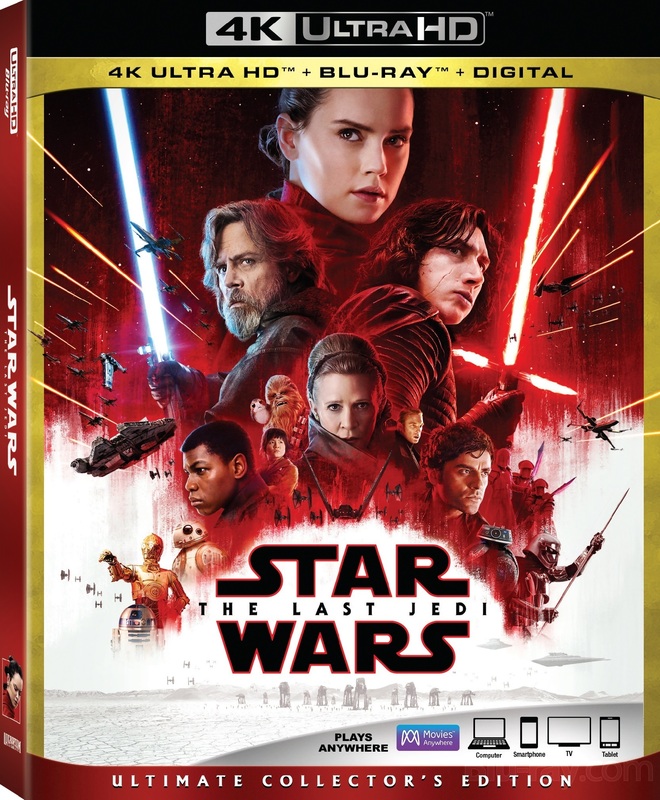 Walt Disney Home Entertainment has officially announced that it will release on 4K Blu-ray and Blu-ray Star Wars: Episode VIII - The Last Jedi. The two releases will be available for purchase on March 27. Lucasfilm's Star Wars: The Last Jedi—the next action-packed chapter of the Star Wars saga— Earned critical acclaim and the No. 1 spot atop 2017's list of highest-grossing films. The visually stunning film welcomes the return of original characters, including Luke Skywalker, Princess Leia, Chewbacca, Yoda, R2-D2 and C-3PO and further explores the deepening journey of the saga's new members, Rey, Finn, Poe, and Kylo Ren. Now families can bring home the movie on 4K Blu-ray and Blu-ray. This release also marks Disney's first title available on 4K Blu-ray disc in both Dolby Vision HDR and Dolby Atmos immersive audio, delivering consumers a transformative viewing experience. Snoke and Mirrors – Motion capture and Star Wars collide as the filmmakers take us through the detailed process of creating the movie's malevolent master villain. Showdown on Crait – Break down everything that went into creating the stunning world seen in the movie's final confrontation, including the interplay between real-word locations and visual effects, reimagining the walkers, designing the crystal foxes, and much more. Andy Serkis Live! (One Night Only) – Writer-director Rian Johnson presents two exclusive sequences from the movie featuring Andy Serkis' riveting, raw on-set performance before his digital makeover into Snoke.